Attention Ad community! This is the last hours to download Tipsy and put in your dream team of potential AWARD Award winners (think fantasy football) before the event tonight. Tipsy is a free event-based tipping app that lets you pick winners during the awards night for the chance to win $1,000 cash. Players select the pieces of work they think will be the most decorated, and score points each time their chosen work wins an award. 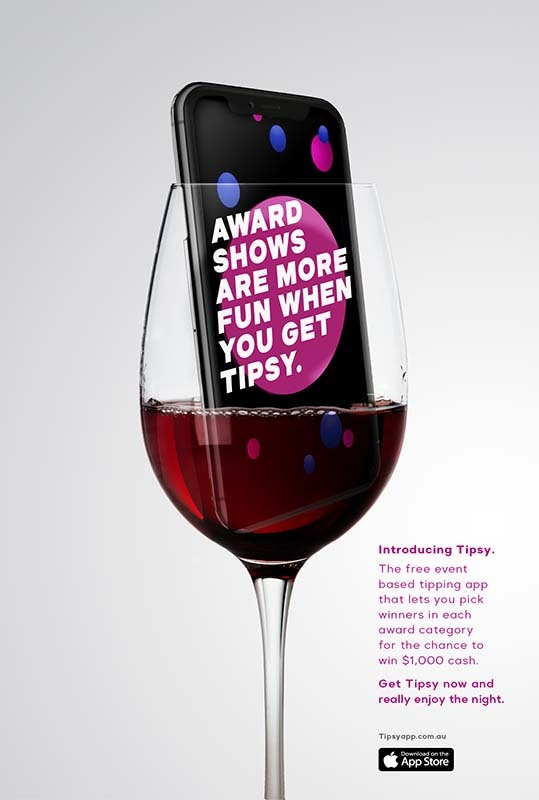 Proven to be already great fun at the B&T and Axis Awards, ‘Tipsy’ is set to give the AWARD Awards some added enjoyment too. They’ll be live-leaderboard tonight to show each players total accumulated score and where they rank amongst other Tipsy players. Whoever ends up on top wins the cash prize. The comp is open to anyone who wants to play – even those who aren’t attending the night’s event. “Download it and have a go. And do it quickly ” all the makers of the app said when asked for a quote. Created by Special Group Australia & Nakatomi, Tipsy is available for download on the app store now. See you at the Australian Technology Park, 1 Locomotive Street, Eveleigh at 6pm.